For an extra special touch, why not send a beautiful Gift Basket to your friends, family or business colleagues when they stay in Branson. Whether it's for an Anniversary, a Birthday, a business meeting or any kind of celebration - we have the perfect gift for you. Each attractively themed basket is filled with just the right mix of fun and goodies. Look below for descriptions of our Gift Baskets. Note: We can have the Gift Basket delivered to where you are staying at no additional cost! Gift baskets ordered within 72 hours of arrival date will be presented upon check-in at the Branson Tourism Center office. Add a little more cheer to the holidays with this Holiday Gift Basket. This festive gift basket is filled with a variety of treats that is sure to satisfy all cravings. If you are escaping to Branson for a romantic getaway, we offer a romance basket. This gift basket includes sparkling juice with two glasses, beautiful lotion, relaxing massage tools, bath salts and soaps, a loofah body net, and of course - chocolate! A romantic evening deserves a romantic gift! Our gourmet gift baskets comes with sparkling juice a selection of chocolates, nuts, cheeses, crackers, and sausage ready to delight the senses for any occasion. 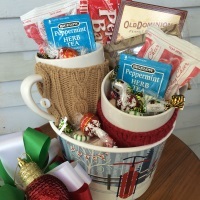 This sweet and salty gift basket is perfect for when snack time strikes. This gift basket is packed with snacks such as chips, crackers, candies, colas, and more! Treat her to some serious stress relief with our Spa Basket! With gifts like perfumed body lotion, cleansing body soap, fragrant bath salts, comforting eye mask, and a loofah body net, she will be relaxed each time she enjoys this thoughtful basket!